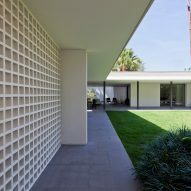 São Paulo firm AMZ Arquitetos has built a home in the city that expands onto a verdant lawn, while a series of planted spaces open to the sky continue the greenery through the property. 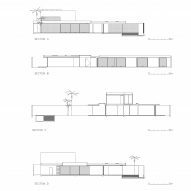 The home is situated in Alto de Pinheiros, a residential district of the large Brazilian city. 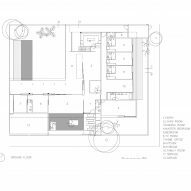 The architects organised the floor plan of the residence around courtyards throughout the home, helping to brighten the residence and group similar spaces together. A pool along the southwest wall and an adjacent lawn make up the west enclosure. 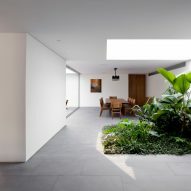 The firm constructed an L-shaped terrace that wraps around the two interior-facing sides of the courtyard. Thin metal poles along the patio support an overhanging roof. A study borders the south corner of the lawn. 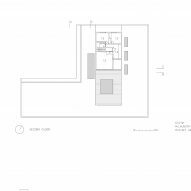 A TV room, a lounge, and a dining room along the northwest edge of the enclosure follow in counter-clockwise fashion. Floor-to-ceiling glass planes offer views of the courtyard from each of the rooms. The glazing can slide into adjacent walls to connect these spaces through the open patio. "[The terrace] connects directly to all living and dining spaces when the sliding doors are open, allowing them full view and direct access to the main garden courtyard," AMZ said. 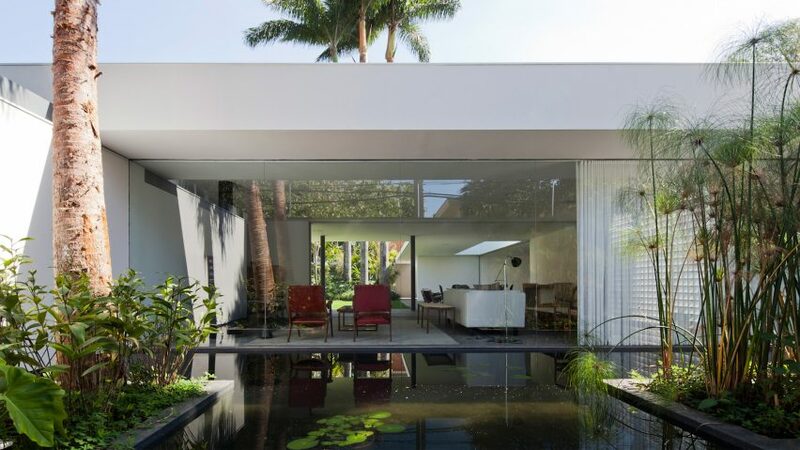 Inside Casa Alto de Pinheiros, a square lobby connects the living and dining rooms to form the corner of the inner L-shaped plan. A door to the right of the entrance leads to the living quarters encompassing the northeast section of the home. A square garden illuminated by a skylight sits opposite the threshold. It leaves a lane of space along the outer wall that serves as a hallway into the dining room. To divide the lobby from the living room, the architects used a perforated partition. The wall extends outside the home, forming the northeastern edge of the "water courtyard", where a plots of vegetation sit on a pond. The lounge spans the length of the enclosures' northwest side. A large glass pane provides the room with a view of the water. "When in the living room, it is possible to contemplate the sky and the adjacent water courtyard," said the firm. 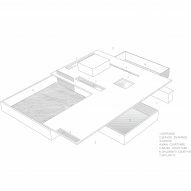 The architects placed a third enclosure along the home's northeastern outer wall. Three small bedrooms and a family lounge have sliding doors that exit onto the "children's courtyard". "The sleeping spaces and family room open up to a more private courtyard that serves as a playground and an intimate outdoor space," AZM Arquitetos said. An interior hallway connects the rooms of the living quarters together. A door at the west corner of the passage leads back to the entrance. Past the dining room, a staircase ascends to a second-storey volume, where a small gym and service rooms are situated. A terrace extends out from the cuboid onto the roof, wrapping around the skylight of the lobby. 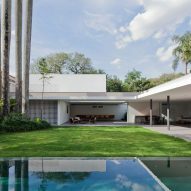 Several other São Paulo residences feature bright courtyards and enclosures, including a narrow house rebuilt for its elderly resident and a home composed of four towers. Photography is by Maíra Acayaba.